We have a few new leaks regarding NVIDIA’s upcoming GeForce RTX 2060 and GeForce GTX 1160 graphics cards, courtesy of Videocardz. 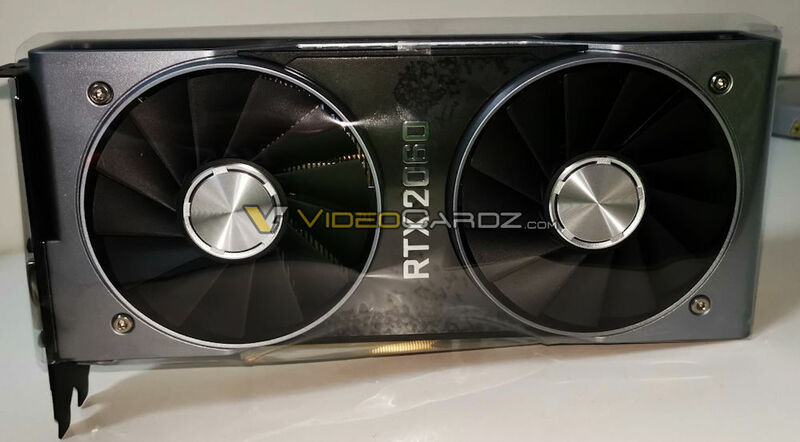 Not only the reference model for the GeForce RTX 2060 has been pictured but we also have the first AIB models leaking out from HD-Technologia and few new details on the GeForce GTX 1160 coming in directly from an OEM. The NVIDIA GeForce RTX 2060 will be the latest entrant in the Turing family of GeForce graphics cards. 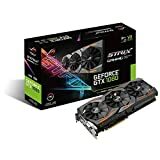 Aiming the mainstream market and a price target of $250 US – $300 US, the graphics card will become popular among the gaming community like its predecessor, the GeForce GTX 1060, which currently holds the top spot on Steam’s hardware database since it launched. 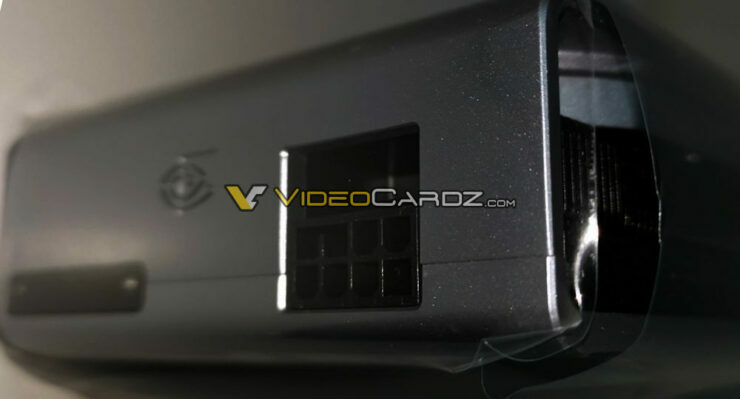 Coming to the details in terms of specifications, we know that the card will be using the TU106 GPU core. 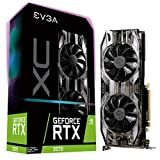 This GPU SKU will be slightly cut down from the full variant on the RTX 2070, featuring 1920 CUDA cores, 240 Tensor Cores, 30 RT cores, 120 TMUs, and 48 ROPs. The card will feature clock speeds in the 1360 MHz (Base) and 1680 MHz (Boost) range while delivering up to 6.5 TFLOPs of Compute performance. Since the card has 6 lower RT cores than the RTX 2070, it may end up with around 4-5 Giga Rays per second worth of ray tracing performance. This would allow for RTX on 1080p with medium settings and a playable FPS. An illustration of what the TU106-300 die on the RTX 2060 might look like. The differences between the RTX 2060 and RTX 2070 have been cut out. When it comes to memory specifications, the card would feature 6 GB of GDDR6 memory along with a 192-bit bus interface, running at 14 Gbps. This would deliver 336 GB/s of bandwidth for the card which is higher than the GeForce GTX 1080 with 10 Gbps GDDR5X dies. 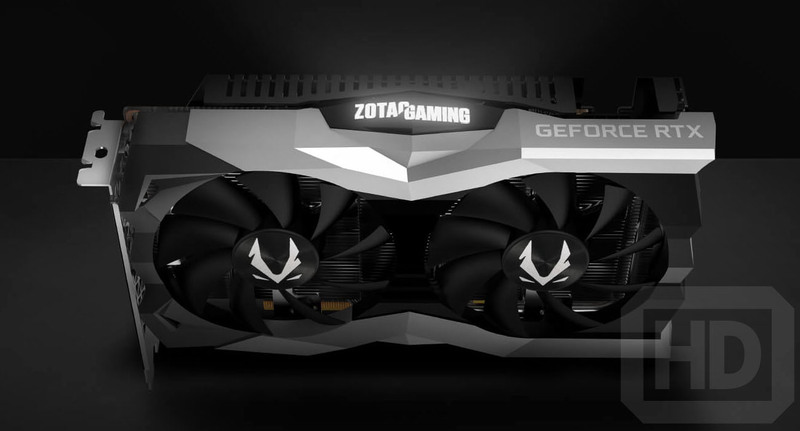 Now coming straight to the design, we can see that the card uses the same shroud as the GeForce RTX 2070 which is smaller than the ones featured on the RTX 2080 and RTX 2080 Ti. It still comes with dual axial fans and the aluminum die-casted metal frame. The RTX 2060 logo can be seen in the middle. The card has the shroud engulfing the entire length of the card and even the back with a separate backplate. There’s a single 8-Pin connector like the RTX 2070 but the card would end up using slightly lower power than the RTX 2070. Display outputs include 2x DP, 1x HDMI, 1 USB Type-C and a DVI-I port. 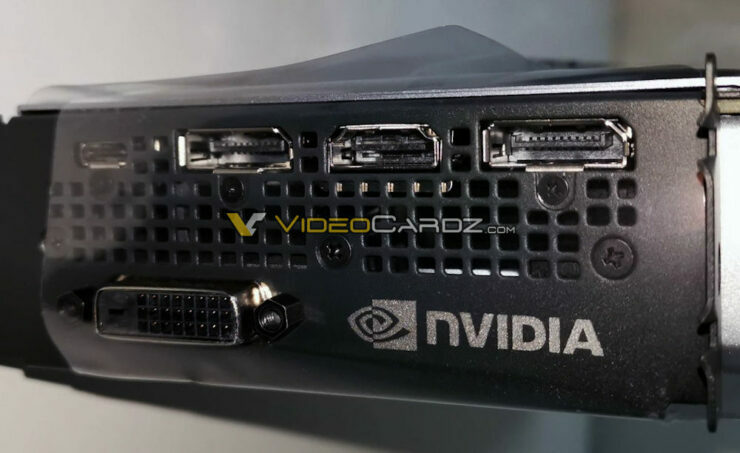 The card also doesn’t feature any NVLINK connector which is to be expected from a TU106 chip based product. Moving on, we not only have the reference model in front of us but also a custom variant from ZOTAC. 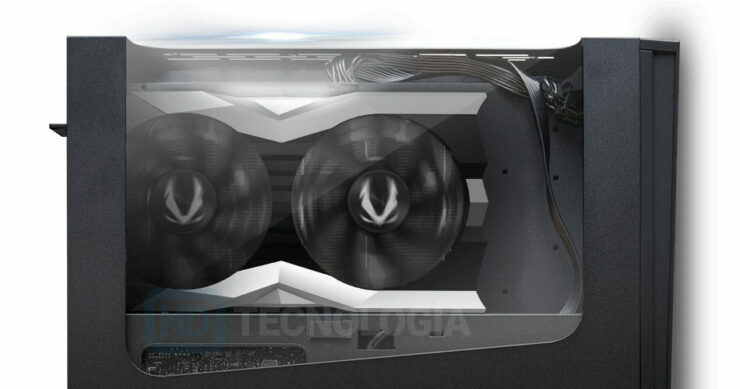 The model known as the GeForce RTX 2060 AMP will be a fully custom design with dual fans on the front shroud which has LED cutouts on the sides. 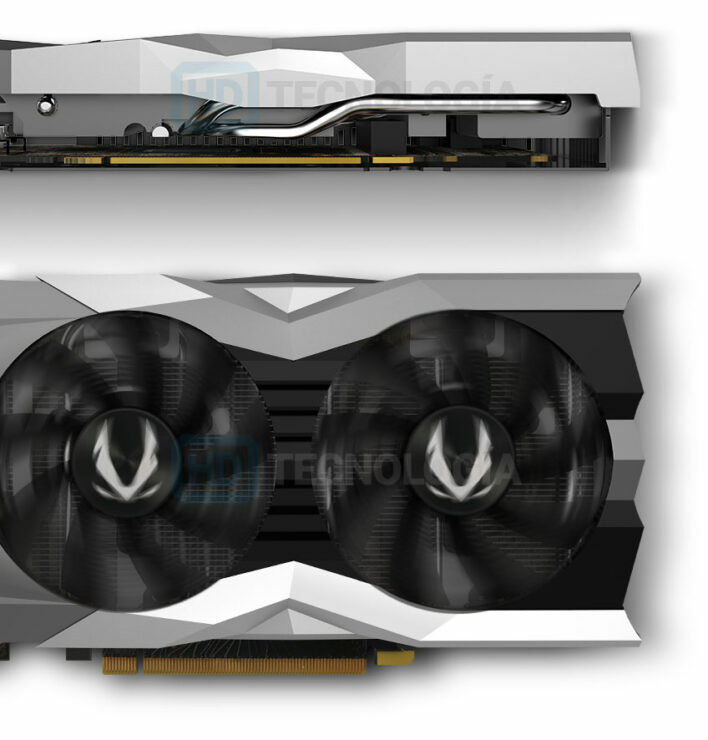 The design looks similar to the ZOTAC GeForce RTX 2070 and RTX 2080 series high-end cards but is very short in length compared to those and lacks the fully engulfed RGB shroud of its big brother. The card also uses an 8-pin connector to both but the interesting thing here is that the PCB is very short, in fact,t the cooler shroud extends beyond the PCB and we can see dual heat pipe going through the metallic blocks that cover the GPU, VRM, and memory die. No other details are given out but we can expect this card in the market around mid of January going by the earlier rumors. 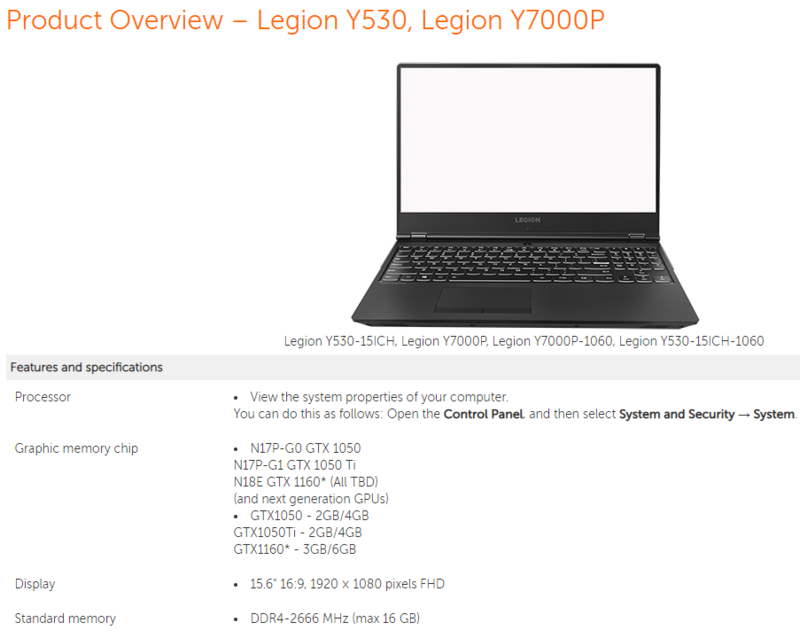 Finally, we have a new development on the GeForce 11 series rumors which is further confirmed by Lenovo through their Legion Y530 laptop specifications page. The page now officially lists down the GeForce GTX 1160 (and next-generation GPUs) which is a confirmation of what we heard a few days ago. It looks like the graphics card would be targeted at mobility users first in 3GB and 6 GB variants, and probably featuring GDDR5 memory die. Now it will be interesting to see if the GeForce 11 series are a more so OEM lineup than an actual consumer focused line which utilizes Turing GPU but lacks the Ray Tracing cores for more cheaper and effective products. 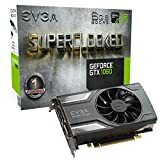 If they do end up being cheaper than RTX cards, than there’s a possible scenario where gamers may want to get their hands on the 11 series cards over the 20 series cards. But then again, these have to be OEM only for such a thing to happen but reports indicate that consumer variants may also be offered by AIB partners of NVIDIA. We will let you know more in the coming days but stay tuned for NVIDIA’s CES 2019 keynote where a range of mobility chips are to be presented.